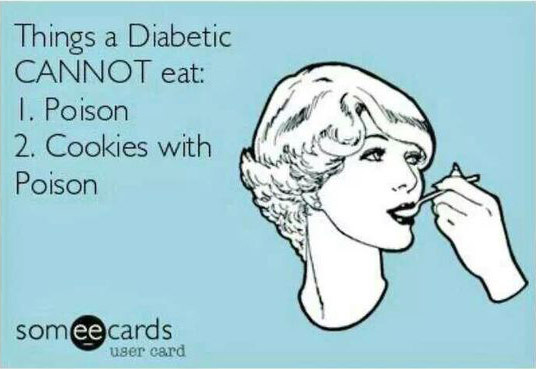 Other ways in which diabetes affects our lives: I worry. I do worry about stuff, all the usual sort of stuff, the kids, money, pet care while we're on holiday etc. ; though I don't think I'm an excessive worrier, but I do worry about Mike. Maybe all wives worry about their husbands, maybe this is totally normal and nothing to do with diabetes, to be honest I have no idea, because this is all I've ever known. I worry when he goes away without me. I worry when he goes out for an evening with friends. Basically, I worry when I'm not there to look out for him. Don't get me wrong, I know I'm not needed, he can look after himself. That doesn't stop me worrying. I suppose it's because there have been times when he has needed help and I know that not everyone would know how to spot the signs, why they are happening and what to do. Mike is an adult, and I am not his parent, but I think I probably worry in the same way a parent does. I worry that people may think he's drunk when he's actually hypo. I worry if he's away and wakes up low, that people will just think he's overslept. If he starts talking nonsense, will people realise something is wrong, or just change the subject out of embarrassment? Who will be there to spot it and help him? My worries are, so far, unfounded. If I could stop worrying I would. I try not to show it, I don't really feel that I have the right to worry in the way a parent does, I have to respect Mike's right to independence, he is my equal. But I do worry, because I love him. Apart from the odd hypo, and a fairly considered diet, there are a couple of other ways in which diabetes affects our day to day lives as a family. The main one of course, is having to know in advance whether there is food provided at a party, or we are likely to be out long enough to need to remind Mike to take his insulin with him. Mike keeps all his stuff in a pencil case, so "Where's your pencil case?" is the question we ask to ascertain whether or not we will be able to eat while we are out. These days he's pretty good at remembering, the pencil case is kept in a good place to make it a visual reminder, but there have been plenty of occasions in the past when we have had to turn the car round and come back to collect it, and once or twice Mike has had to manage without by either being very restrained and not eating, or choosing carefully. It does affect us all, not only when we have to wait until we get home, but also if we don't. There is nothing joyful about eating party food in front of someone who can't join in. It's all about being prepared really, and part of that preparation is communication. It isn't the easiest thing in the world to ask the kind person who has offered the party invitation as to whether or not they will be feeding us, it feels a little cheeky. Mike does not like to be so bold. I find it easier, though maybe that's because I'm finding out on someone else's behalf, it's not really me that's 'making all the fuss', not that it is a fuss, but I think that is how Mike sometimes feels. He's not one to draw attention to himself. It's easier now the girls are older, they are more able to wait, even if they are hungry. I never went anywhere without snacks to keep them going when they were little, again, all about the preparation. Hungry children don't make life worth living, and I'm just as bad. Mike doesn't tend to get hungry, unless he's hypo, it's a useful signal. But it also means that being out with three hungry women, who can't have lunch until we get home because he hasn't brought his kit, does put him in a quite dangerous position which he doesn't necessarily recognise or understand. On the whole, it's a good idea to keep asking the question: "Where's your pencil case?" 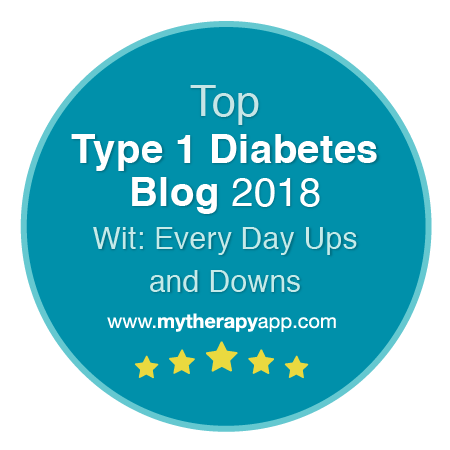 I came across the Bitter-Sweet Diabetes Blog the other day, written by Karen in Conneticut, US. 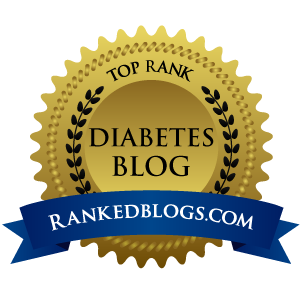 When we began writing this family blog of living with diabetes we did a bit of looking around and while there were a bunch of active bloggers in the states, and some in Europe, those in the UK were a little harder to find. It would seem that Karen is part of a fairly wide-reaching network of diabetic bloggers both in the US and further afield (the Diabetic Online Community or DOC). 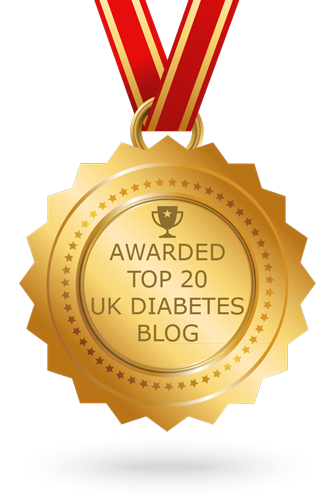 Last week, Karen had a moment of inspiration and decided to set up Diabetes Blog Week (May 10-16) to inspire anyone writing about their experience of diabetes with a week's worth of topics. Today is Day 4, and the topic is 'To Carb or Not to Carb'. Sometimes you look back on your life and think, well that was lucky. And that's just how I feel about my diagnosis. I know that's a slightly odd thing to say, but of all the long-term conditions one could get I think diabetes is a pretty good option. Yes you have to change aspects of your life. Yes sometimes it's incredibly frustrating and gets in the way. Occasionally it's quite scary both for you and those around you. On the whole though it is fairly easy to get along with (or even pretty much ignore for very short periods). Only quite recently I have come into contact with several people (both T1s and T2s) who manage their diabetes with a very low carb diet, some with spectacularly good effects. I don't go very low carb myself, tending towards 150g/day, sometimes much higher. In fact the more I read of the experiences of T2s the luckier I feel with T1. At least if I've got a big celebration blowout I can split a whopping insulin dose into several phased deliveries so that it gets gradually absorbed as my digestive system chugs through it all. The secret to a happy, healthy diabetic diet I think is best summed up by this: Eat to your meter. Testing just before meals is not enough for me. I also need to check what happens in the hours afterwards. That way I can identify which foods cause spikes (or crashes) in my blood sugars, and then I can either avoid that food, or work around the problem with altered doses, splits and timings. Once the patterns have been spotted I've more chance of knowing what to do. Everyone is different. What works for me may not work for you. If you eat low carb and it works, brilliant. If you eat carbs and you can manage it, great! The bottom line is keeping your control tight. That way we'll all keep well. The stress factor. How do you measure that? Any ideas? We were first aware of the 'stress factor', as new parents, one of the most stressful times in your life I suppose, though at the time you are far too tired to notice. Patterns begin to emerge, hypos with no sensible explanation. There is no way of knowing whether it is stress that caused those hypos, that is just our own theory. I will describe the events that caused us to make this assumption, and you can decide for yourself. Picture the scene, one exhausted wife, Ellen aged four (talking non stop), Beth aged two (constantly running off, talking to strangers and potty training), one diabetic husband, Saturday morning, Asda. To be honest I could probably leave it there and you would already agree this is not looking good for the stress levels, but I will go on. To let you understand quite how stressful this whole situation was for Mike, I also need to mention that I hate shopping. All shopping. I have a very precise, well planned list to work from to ensure that the deed can be done in the minimum amount of time necessary, and at the time, we were on a pretty tight budget, so any extra purchases had to be applied for and approved by, well, me. No, there is nothing fun and spur of the moment about shopping with me. Ellen, bless her, did talk incessantly when she was four. It was very sweet, but unbelievably distracting, and after a while you want to say "Shush." Even if you do, when they're four, it doesn't work, so there's not a lot of point. Beth was, shall we say, entertaining, aged two. She ran everywhere in a very determined way, while Ellen walked very slowly, talking. Then there is potty training. When you hear those wonderful words, "I need a wee." you have to drop everything and run to the nearest loo, there is no time for dilly dallying. You have a trolley full of shopping, a four year old with no sense of urgency and time is ticking. An extra pair of hands at a time like that is a godsend, so we went as a family. Within the first five minutes of every shopping trip we attempted, Mike went low. I would be listening to the steady hum of Ellen yabbering away by my side, keeping one eye on Beth's whereabouts and the other eye on the shopping list, and would turn round to realise that Mike had disappeared. We would have to backtrack until we found him, usually standing by a shelf lifting something off and repeatedly replacing it. Then I would open the pack of funsize chocolate bars I'd put in the trolley and start feeding them to Mike, while answering Ellen's questions, saying that yes technically it was stealing but we would be paying for them when we got to the check out, and they would understand because it was a medical emergancy, and no she couldn't have one, Daddy was only eating it because it was his medicine, and even if she wasn't feeling very well it wouldn't be the right sort of medicine to make her better because she wasn't diabetic and yes I did know that for a fact and right about now Beth would say, "I need a wee." We tried the shopping just enough times to establish this was a repeated pattern, and then gave up. Over the years Mike has recognised a number of activities that seem to have the same effect on his levels. Whatever you may call it, stress, nervous tension, whatever it is, probably causes different reactions in different people depending on how you deal with it. I'd call it an impossible science, but I am seriously chuffed to say that since we've started blogging, and Mike has been chatting to people and researching solutions to some of the problems he was facing, the necessity for me to intervene and sort him out has reduced dramatically. Life is good. I am not, as Jane will tell you, a morning person. It's not, I hasten to add, that I am at all grumpy(! ), rather that until something approaching 9 or 10am you are lucky if you get more than a grunt out of me. And then there's the sighing and yawning. Lots of that. Over the last few years, mornings have also had an added complication in that it has not been unusual for me to wake up a little low. More often than not it's just a case of something sugary with my coffee and all is well, but it's never a good start to a day. A few times a year I am not only low, but my levels are dropping, and Jane has had to intervene. Since we've been blogging about our experiences of living with diabetes this has been a nut I've been trying to crack. I've tried dropping 2 units of Lantus which seemed to throw my system into a high-sugar tantrum. I've tried dropping 1 unit of Lantus, which involved getting hold of a new, slightly different Autopen. I've tried various amounts of carbohydrate at suppertime to stave off the morning low. None of these has been particularly successful. So now I'm trying something something suggested by a commenter on this very blog. I've moved my Lantus injection to the morning rather than last thing at night. Although Lantus is often said to have a 24 hour peakless profile in reality many Lantus users find the graph is a bit more complicated than that. Indeed this graph on lantus.com shows a slightly flattened version of what I believe happens in my case. It shows a period of onset rising to a mini-peak 4-6 hours after injecting; followed by a slight drop and levelling off; then a fall-off of activity at around 18-28 hours (which I believe can be more or less depending on the person). If my morning lows are due to Lantus's higher level of activity in the hours after injection - at the time when it appears I need less background insulin - then a move to a morning injection should match the fall-off of activity with my reduced need. It's only been a few days yet and I've not had a chance to run any basal tests to see how things are going, but so far I've not had a pre-breakfast low and levels through the rest of the day have been pretty much what I'd expect. So far so good. I'll let you know how things progress.